Home » Health » Oral Healthcare » Kid's Oral Care » Delayed Tooth Eruption in Kids – Should You be Worried? The first tooth erupts after six months of the birth of a child, but this varies from one baby to other. Not all the babies get their teeth at the same time and, eruption time for teeth is different in different babies. 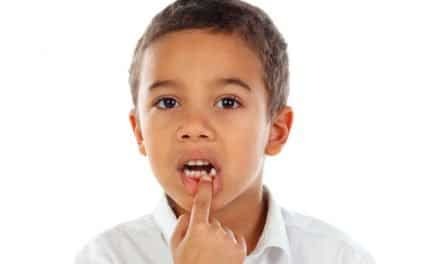 Sometimes there could be delayed tooth eruption in kids and this can be caused due to several factors such as Down’s syndrome, malnutrition, genetic abnormalities, etc. If a baby does not have any teeth by the age of 18 months, then take your child to a dentist for an examination. Delay in teething is not always a problem but there may be underlying causes for delaying of teething in some infants. Most of the teeth are already formed when the child is born, but they are present inside the jaw covered with the gum tissue. Teething is the process in which a baby’s teeth come out or breakthrough the gums into the oral cavity. Teething in a baby generally occurs between 6 to 24 months of age. The lower central incisors (front teeth) erupt first, followed by the four upper front teeth (central and lateral incisors), and then later the remaining two lower front teeth. The rest of the teeth generally come out two at a time, one on each side of the mouth. Till the kid reaches the age of three, nearly all complete set of 20 primary teeth have erupted in the oral cavity. What are possible reasons for delayed tooth eruption? There could be several reasons for the delay in teething. Sometimes delayed tooth eruption runs in the family and can be inherited from the parents. Late teething is very common with babies who were born premature or were underweight after birth, and they may even have enamel defects. Conditions like amelogenesis imperfecta and regional odontodysplasia can cause the teeth to erupt late and form poorly. Why should you be worrying about late teething of your baby? Kids with no teeth even by the age of 18 months should be taken to see a dentist. 6 to 15 months of age is the normal range for the eruption of the first tooth. Most children have four teeth in their oral cavity by the time they are 12 months old, and they have all the 20 teeth at 27 months after birth. If the teeth that do not follow a regular eruption pattern then there isn’t necessarily a concern. But in some cases, late eruption of teeth can indicate a disease or deficiency of some nutrients. The baby may need orthodontic work in future, as baby teeth serve as a guide for permanent teeth to erupt in proper position on the jaw. Delayed tooth eruption that isn’t part of a severe problem shouldn’t be a matter of concern. But it can create a higher risk of dental problems in the future. Some studies state that the children who were genetically affected to late tooth eruption found with higher chances of needing orthodontic treatment by the age of 30 years. The presence of primary teeth play an essential role in helping kids chew better, and they also guide permanent teeth to correct position in the oral cavity to serve the same purpose. Delaying in the eruption of primary teeth will prevent your kid from chew properly and they may also experience indigestion. Due to poor digestion, your child will be exposed to fewer nutrients making your child weak. How to take care of new baby teeth? When the baby teeth finally appear, they require regular proper cleaning with toothpaste for infants and soft-bristled brush to prevent early decay so to keep these teeth till permanent teeth appear. Cleaning of the gums using the washrag twice a day. Prevent your child to take milk bottle to their crib or bed. Avoid sugary food and drinks. Do not stop brushing and flossing. You can even brush lightly in the area where the teeth have erupted. You should use toothpaste only when your kid is two years of age. Baby teeth also called primary teeth, or deciduous teeth appear in the oral cavity by the age of 6months. The process of the tooth coming out through the gums and becoming visible above the gum line is called tooth eruption. Sometimes these teeth don’t erupt even 18 months after the birth which worries many parents. In many cases, late teething is not something to be worried about, but you should consult a dentist if no teeth have erupted by the age of 18 months in your child’s mouth. The dentist can examine your child and look for a possible medical cause and discuss your family history. PreviousHow to Deal with Sensitive Teeth After Dental Cleaning?